The material of hot water thermometer is mainly copper and iron. It has its temperature sensor. Hot water thermometer is mainly used to measure water temperature. It's applicable for HVAC service. The hot water thermometers are designed for high-accuracy temperature readings of hot water lines, boilers and hydronic systems to +250°F (+121°C). This unit features a bi-metallic element, aluminum stem and case material and offer accuracy to ±1% of span throughout entire range. 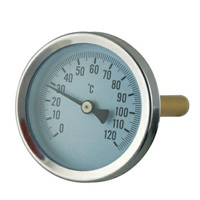 The thermometer is available with standard 1/2 or 3/4 NPT male separable socket or 1/2 or 3/4 NPT sweat well connection that allows easy thermometer removal while maintaining a “sealed” system. Ma Anshan Exact Instrument Co., Ltd is a professional manufacturer of all kinds of high quality instruments. Our products are widely used in oil, chemical industry, metallurgy, electricity, manufacture, papermaking, food, energy, etc. Our products have been exported to U.S.A, Canada, Europe, Spain, Egypt and South-east Asia, mid-east and so on.